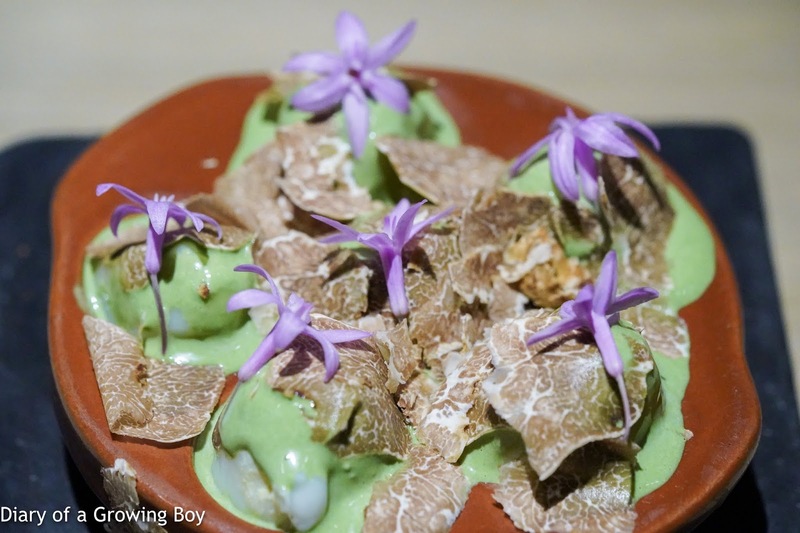 Pigeon eggs / parsley mayo / white truffle - not the first time I've had pigeon eggs here, and not the first time with white truffle on top. But WTF is with the garlic flowers on top??? Since when did The Man in White T-shirt start using his tweezers to put flowers on his dishes?! Are we still talking about the same guy, or was he secretly kidnapped by aliens and replaced by a dummy? 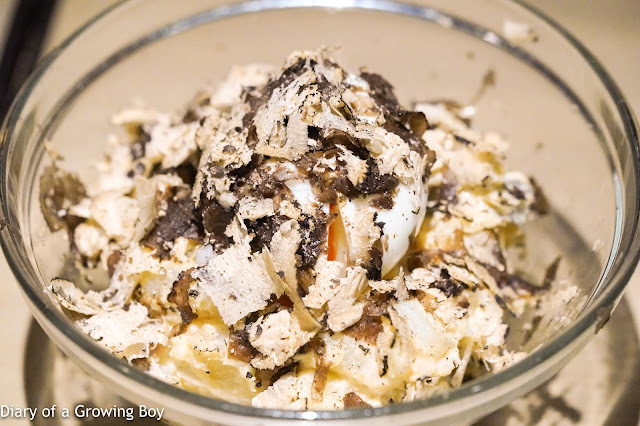 Smoked eel potato salad / autumn truffle - very delish, but the chunks of potato are kinda filling. The soft-boiled egg on top is always nice, as are the truffle shavings. 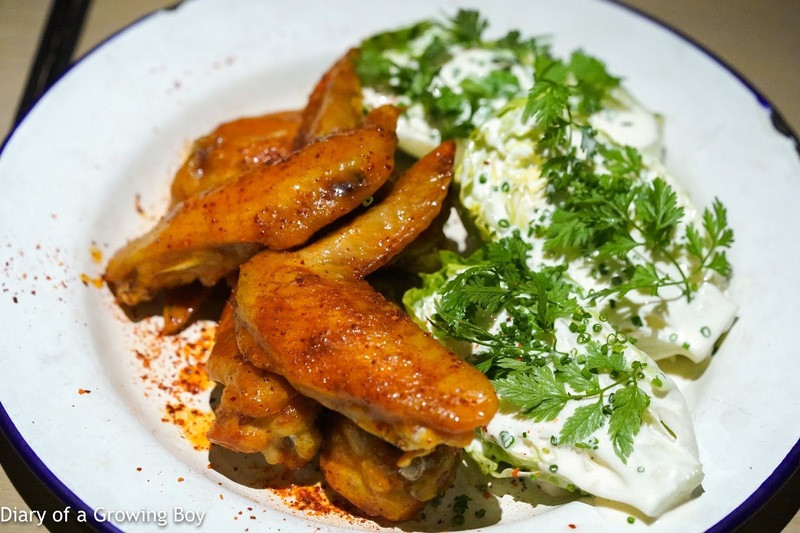 Buffalo chicken wings / sucrine lettuce - interesting to see this combination, and there's yogurt sauce on the sucrine today. Bouchot mussels "Mt St Michel" - Sébastien was intrigued by the curry sauce that came with the mussels, but of course everyone was happily digging into the bouchot mussels. 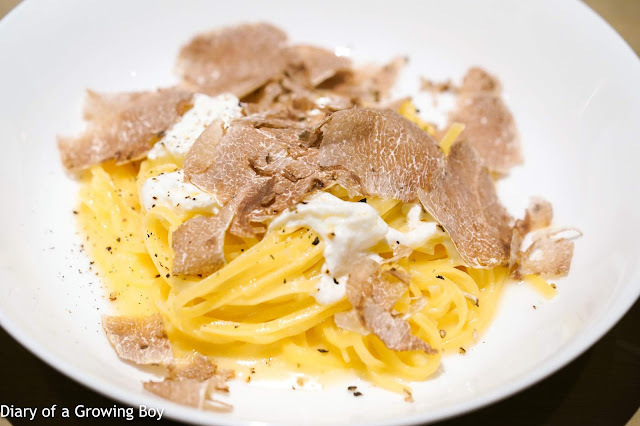 Handmade tagliolini / burrata / white truffle - the Man in White T-shirt joked that he was gonna get a lot of flak from Italians for putting burrata on top of pasta, but this was a nice substitute for cream. As usual this tagliolini was cooked simply with some butter flavored with some chicken stock, and came with some white truffles. Inhaled. 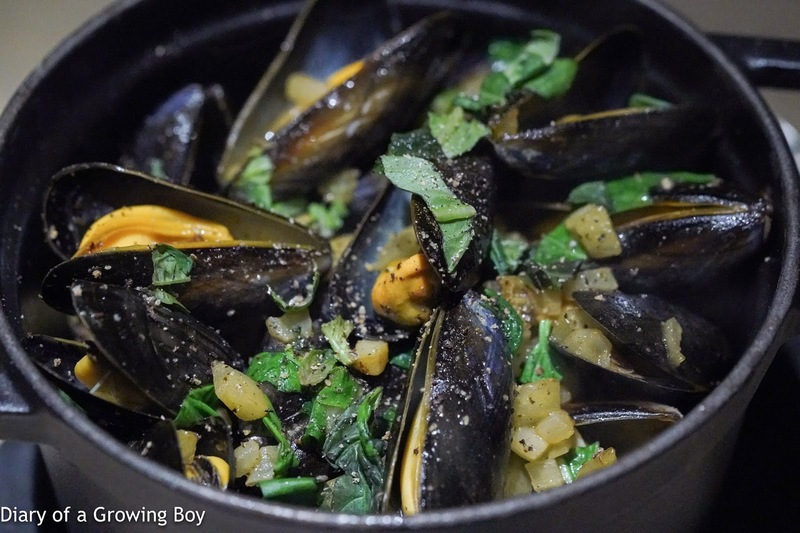 Squid ink garganelli / crab knuckles - more leftovers from last week... The two Frenchies at the table had a tough time with the heat, and I was surprised to be the only one who was kinda OK with it. 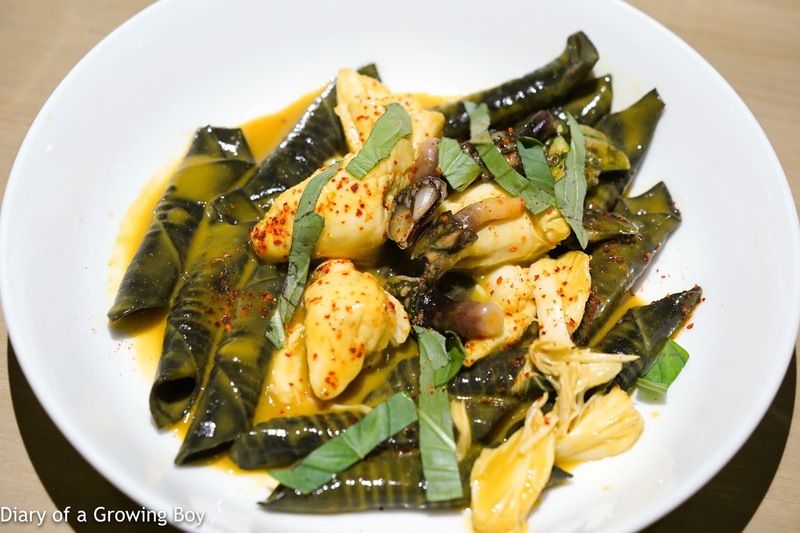 This was my first time seeing the squid ink version of the garganelli here, and tonight they came with crab knuckles - which had been described as "coming from Jay Fai" - that were sweet and bouncy. 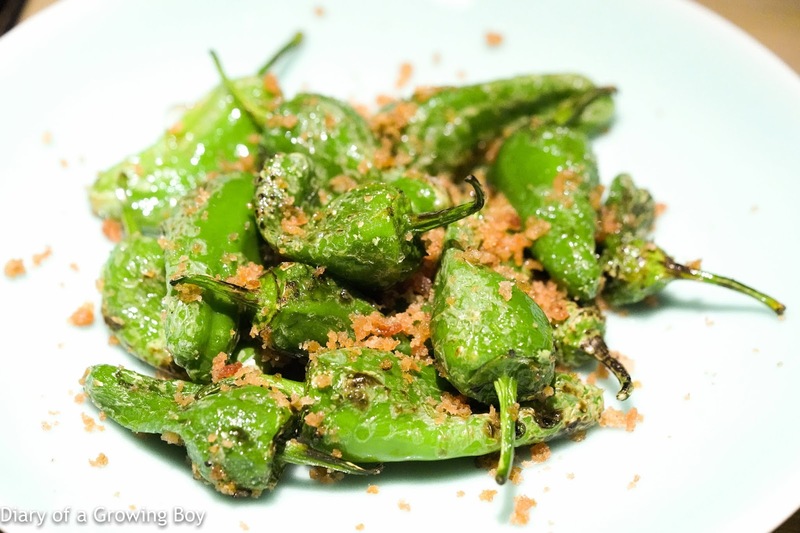 Small gooseneck barnacles and Thai basil completed the mix, along with a sweet Thai curry that had a very silky and almost 'slippery' texture. Certainly one of the better dishes tonight. Oriental sole meunière - it's not often that I can make DaRC jealous, but in spite of impressive seafood hotpot/shabu-shabu at their table - with crabs, lobsters, and other goodies - this was not part of their menu. 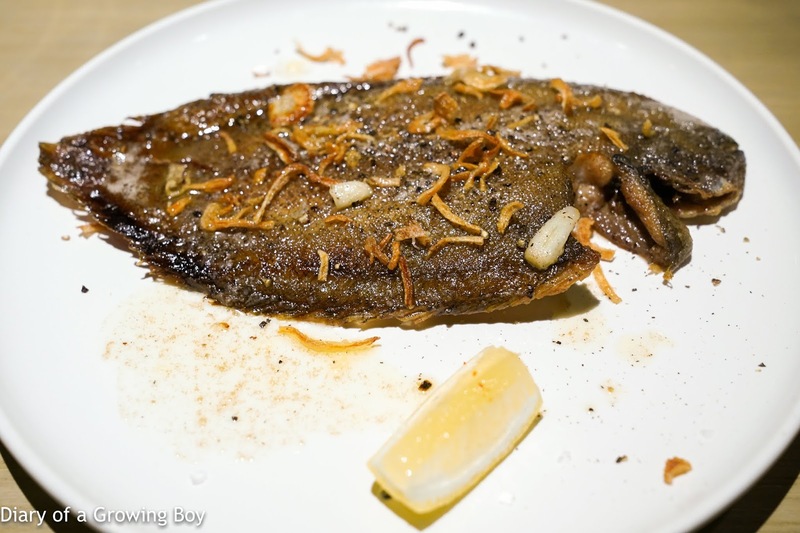 In all my years of dining at establishments run by The Man in White T-shirt - in fact, in all my years of dining in Hong Kong - this was only my second time having the rare oriental sole (七日鮮). Unlike Hairy Legs and Seb - who were seasoned professionals in top restaurants - I couldn't fillet the sole cleanly. 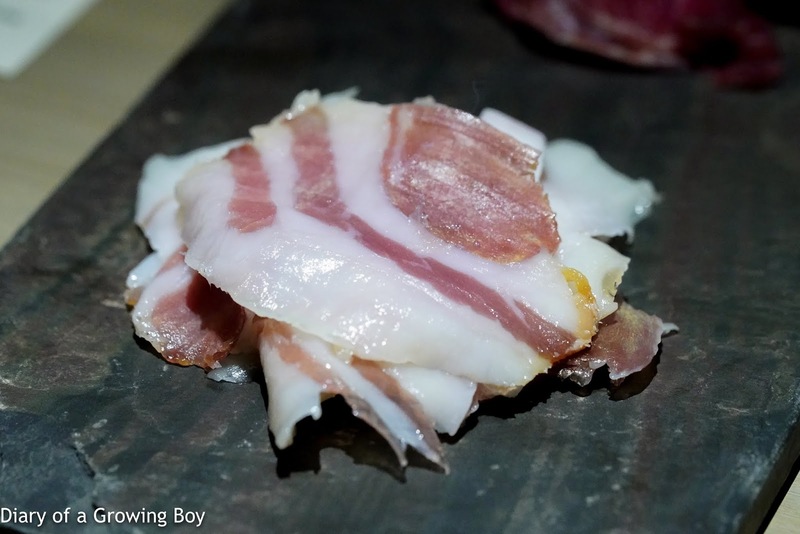 But that didn't matter, as the fish was still delicious even though I butchered it. And as I was getting pretty full, I motioned for DaRC to come and share my fish. He dug into it pretty eagerly... and motioned for someone else to come and join him. 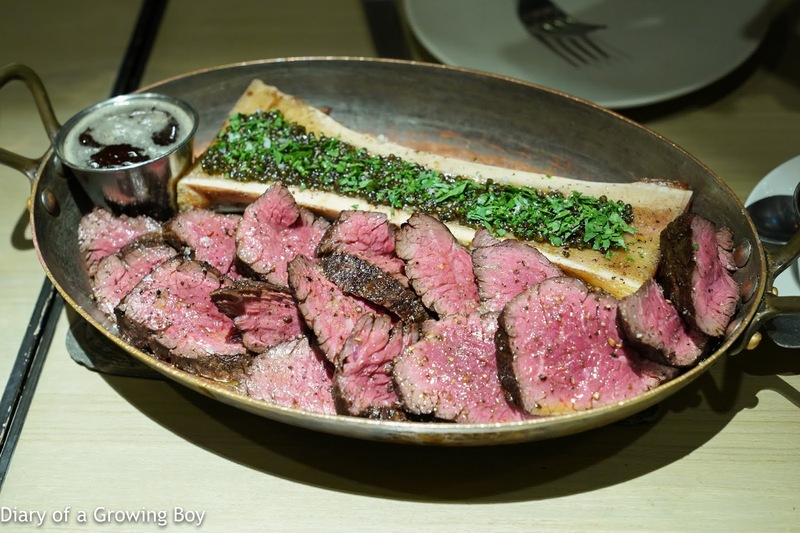 Aubrac beef hanger steak / bone marrow / caviar - I honestly didn't know why the boss expected us to fit in more food, but we still had the Aubrac onglet... together with the bone marrow and caviar that I had just a few days ago. 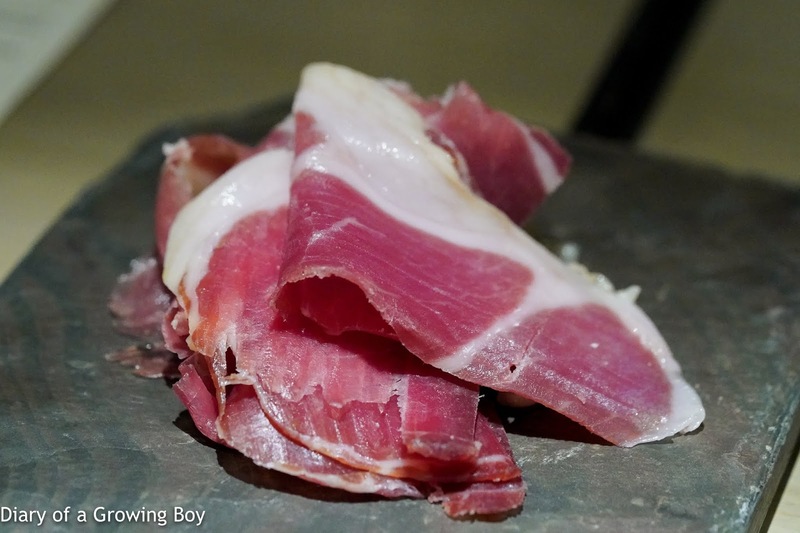 Tonight, though, this came with some beurre noisette that I greedily drizzled over the beef. There was, of course, no way that we could finish the beef. I found out that our neighbors were having a pescatarian menu, so I figured that Ro Ro must be craving for some meat... Which was why I also motioned for her to come over and share in the bounty. She was pretty happy about that. 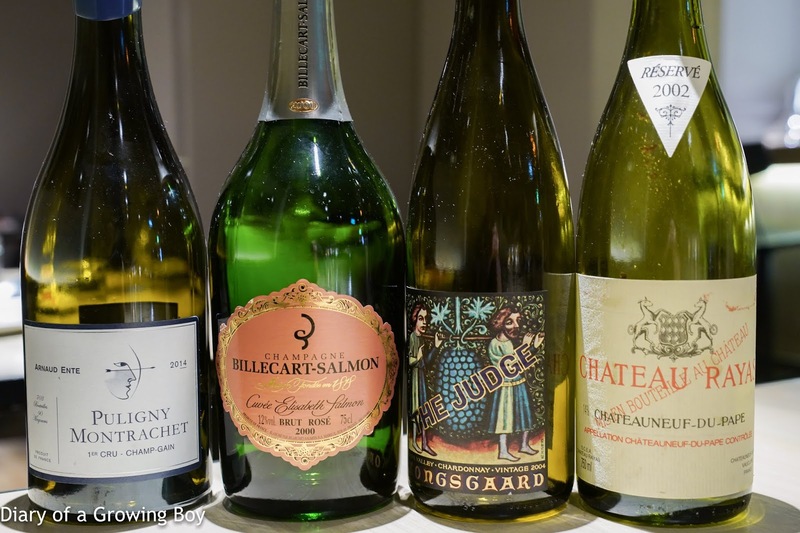 We brought out a few nice bottles for our friend, who also contributed a great bottle of his own. 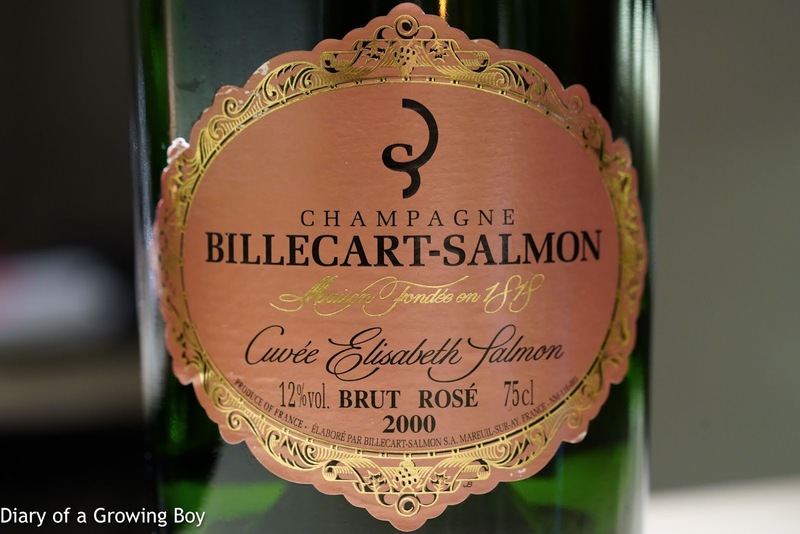 2000 Billecart-Salmon Cuvée Elisabeth Salmon - lovely and caramelized, very toasty, almost like a brioche. 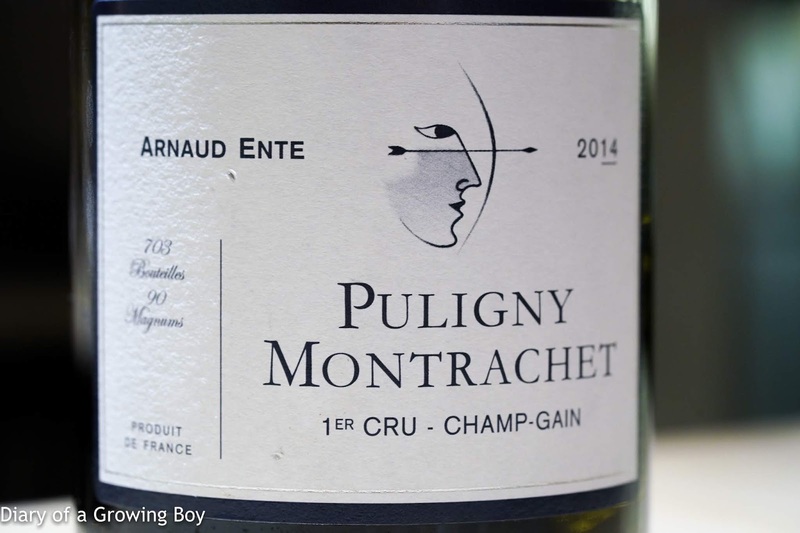 2014 Arnaud Ente Puligny-Montrachet 1er Cru Champ-Gain - very toasty nose, nice minerality, almost tropical stone fruit, with high acidity on the palate. 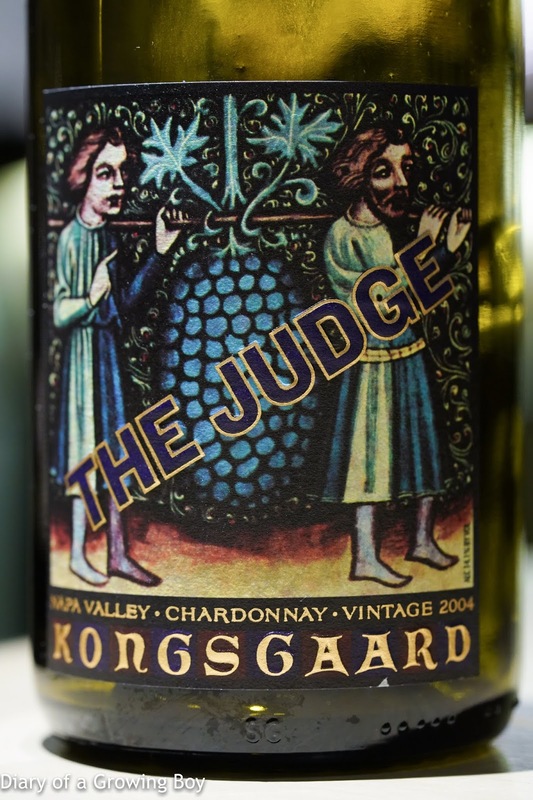 2004 Kongsgaard Chardonnay The Judge - opened about 50 minutes prior to serving. Very caramelized and sweet nose, with vanilla. Overripe as I had feared and hot on the palate. Mineral and flint notes, with almost a little acetone. After 1½ hours the nose turned really buttery. 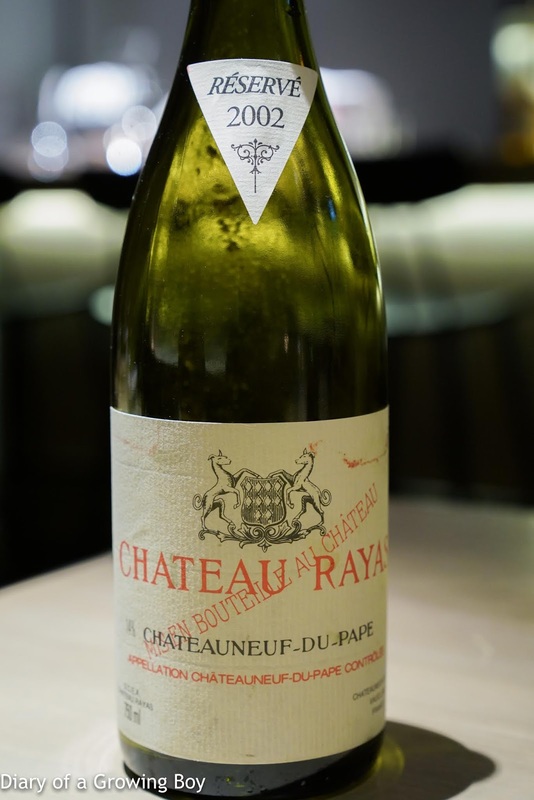 2002 Rayas - popped and poured, just sooooo beautiful right off the bat. Strawberry jam, roses, almost lychee of course... just amazing and floral. And as close to Pierre Hermé's Ispahan as a wine could come. 1989 Suduiraut - rich and grapey. Like a good ol' Sauternes.